Karnataka Army Bharti Rally 2019 | District Wise Sena Bharti Rally | Indian Army Bharti Rally 2019-20 | Open Army Bharti in Karnataka | Centre Army Bharti for Karnataka Candidates. Registration Start Apply Now for Karnataka Army Bharti Rally – Check Here District Wise Rally Schedule. Karnataka Army Bharti Rally 2019: On our page, all of you will be informed about the latest notification of Indian Army recruitment in Karnataka. Indian Army notification of all Rally recruitments in the coming time in Karnataka will be updated on this page. Indian Army Recruitment Department will issue a notification for the vacancies, such as Soldier General Duty, Clerk and Tradesman. 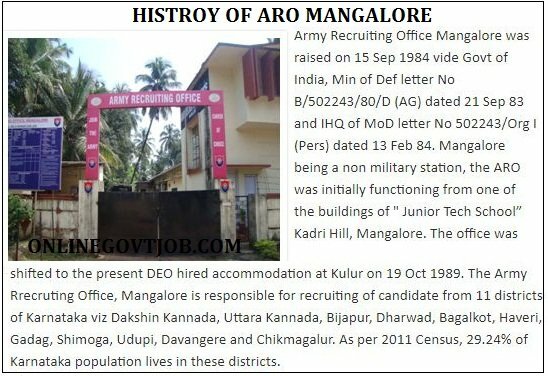 01 ARO Mangalore Army Bharti 28 May-06 June 2019 Check Details Below. Soldier General Duty (GD) for All Arms. Soldier Clerk / Store Keeper Technical (Trades) for All Arms. Soldier Nursing Assistant (Army Medical Corps). Sepoy Pharma Army Medical Corps. All Arms except Syce, Mess Keeper & House Keeper. Syce, Mess Keeper & House Keeper. Havildar Education Army Education Corps. The candidate must have the 12th pass (Arts/Science/Commerce) With 50% in each subject and 60% marks aggregate subjects for registration Karnataka Army Bharti Rally Application form. Should have studied English and Maths/Accounts in Class 10th or 12th. The candidate must have pass 12th class with Physics, Chemistry, Biology, Mathematics and English with 50% aggregate subjects and 40% marks in each subject for registration Karnataka Army recruitment technical post. The subject of biology is only necessary for the Army Military Nursing Assistant post. Group Y – BSc/BA/BCA/B Sc (IT) (w/o BEd). The candidate must have the 12th pass and Diploma / Certificate of one year Course or more in Cookery Hotel Management Course and Catering Technology Course. The candidate must have complete graduation degree BA/BSc with Maths subject. For Karnataka Army Centre the candidate must have completed 10+2 / Intermediate and also qualified in D-Pharma with minimum 55% marks in aggregate from registered with State Pharmacy Council/Pharmacy Council of India. Andhra Pradesh, Kerala, Goa, Karnataka, Tamil Nadu & Puducherry. Candidates applying for recruitment for Indian Army will complete the first point of the race in the Karnataka Army recruitment rally’s, those candidates will be approved for the next physical steps. The Indian Armed Forces, the race is the principal object of the physical level. At least 48 kg or 50 kg of weight should be for all positions of the Indian Army, such as GD / Clerk / Tradesman / Nursing Assistant / Technology. Weight will be defined according to the height of the candidate depending on the medical rules of the Army Center of Karnataka. Zig-Zag has to walk on balance and maintain himself on a steady state. A candidate must have the muscular structure and good mental health. The chest must be well amplified having minimum 5 cms expansion. The candidate must have normal hearing with each ear and good binocular thought in both eyes. Candidate must be able to read 6/6 in distant concept chart with each eye. The candidate Colour vision should be CP – III (able to understand white, red and green signal colours correctly as shown by Martin’s Lamp at 1.5 meters). Candidate must have enough number of natural healthy gum and teeth minimum 14 dental points. Must not have diseases like damage of bones, hydrocele and varicocele or piles. Indian Army Soldier General Duty for infantry must have 6/6 eyesight. Email Id (ईमेल आईडी): Each candidate must have a personalized email ID. Instructions regarding shortlists, call letters, any type of exam, instructions for changes in the physical fitness test date, examination results, merit list etc about of Indian Army Bharti will be sent by the Army Department on Email id. Written Examination (Karnataka Army centre). Our Page Candidate can get full information about district-wise recruitment. The history of the Indian Army is also explained in detail on this page. Information about different Army Recruiting Offices is given. We hope that by looking at our information, we can feel comfortable joining the candidacy of the Indian Army. Latest notifications of Indian Army are updated on this page by us. So Candidates are advised to see this page from time to time. Districts List 11 districts of Karnataka, Uttar Kannada, Dakshina Kannada, Udupi, Davanagere, Bagalkot, Vijayapura, Dharwad, Gadag, Haveri, Chikmagalur & Shivamogga. Districts List Districts of Trivandrum, Pathanamthitta, Alleppey, Ernakulam, Kottayam, Idukki & Kollam. 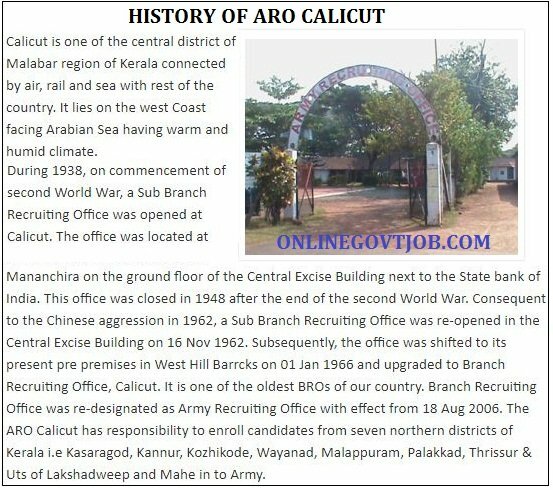 Our web portal page daily latest update and upcoming jobs, Admit card, Exam Results & other Announcement about Indian Army Bharti recruitment. Our web portal onlinegovtjob.com is not responsible for any query or mistake. So suggested to candidates that please check also official website notification for Karnataka Army Bharti.